Space and lots of Comfort with 2,400 sq ft! Sleeps 11! Updated, spacious 4 bedroom 2 bath home in a quiet neighborhood with mature shade trees and neighborhood playground. The home is centrally located in Edmond so you are just minutes away from shopping, restaurants, Mitch Park and the YMCA, Barnett Field Splash Pad, UCO campus, Downtown Edmond and still an easy 25 minute drive to Downtown OKC. During your stay, you can spread out and relax on a new sofa and loveseat and enjoy a 55 inch, 4K flat screen TV with access to Netflix, wiifi and Internet TV. The kitchen nook has a 4 seat table and the formal dining features a beautiful farmhouse table that can seat 8 people comfortably. The master suite offers a comfortable queen sized bed with a pillow top mattress, microfiber sheets and a flat screen TV. The master bathroom includes double sinks, a separate tub and shower and a big walk-in closet. Two guest bedrooms feature a queen sized bed and the third has a fun, twin-over-full sized bunk bed that can comfortably sleep 3 guests. The second living room is stocked with board games, a large sleeper sofa, and a couple of chairs that create an area away from the TV for some fun, quality family time! Enjoy the mature trees and quiet fenced in backyard with outdoor seating and charcoal grill. We want you to enjoy your stay so all our beds have microfiber sheets, a variety of pillows, and extra blankets. A pack n play and booster high chair are available for those traveling with small children. A storm shelter is located in the garage so you can relax during your stay no matter what the weather is doing outside. I am a wife and a mother of two high energy boys. Our family loves the outdoors and enjoy camping, fishing, hiking, swimming, riding bikes and just about everything in between! I have been a stay-at-home mom and am now starting my new career in property management! I hope you like what you see and that we can host you and your guests in the near future! This home is centrally located so it is a convenient drive to just about anywhere you need to get to into Edmond and still a short drive to Oklahoma City. 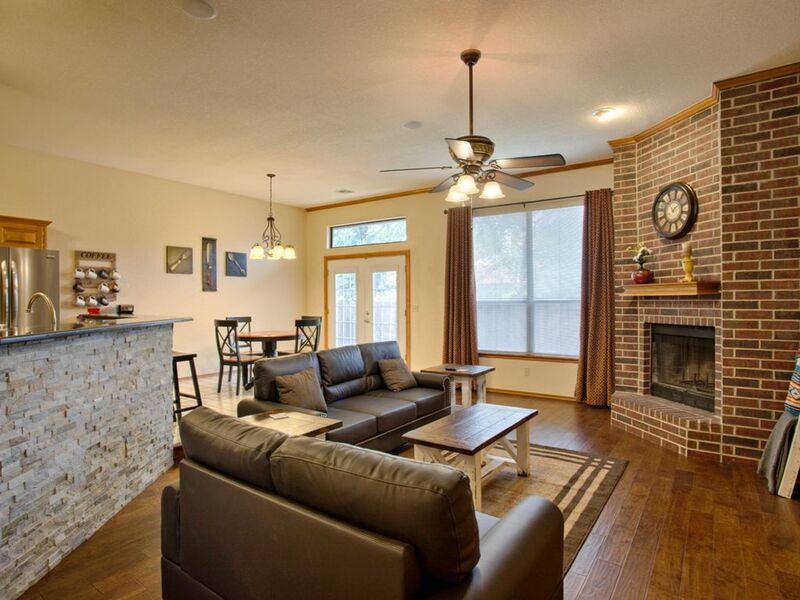 The home offers the space, bedrooms, and finishes we wanted for our vacation rental. Smart TV so use of different TV aps and Netflix. This is a large and lovely property with plenty of room for the family to gather together or spread out. We had a beautiful family Christmas here in this well-stocked, modern, immaculate house. Especially appreciated the great location, fenced back yard, and open concept kitchen/family room. Thanks for taking such good care of our home! Please come back next time you are in town! Thank you Jackie for being so easy to work with--we enjoyed our stay! Perfect place to stay when you are visiting OKC! Owners were very helpful in activity planning and the House was immaculate! Would recommend to anyone traveling to OKC! Perfect for our family when we came to OKC for our daughter's wedding! Great house for a crowd with 2 double vanity full baths and 4 bedrooms. The outlets in the bathrooms need to be brought up to code as they are not functional currently. That was the only inconvenience we experienced in this great house in a great neighborhood! Todd and his family were great guests! To respond, the outlets in the bathrooms are up to code and GFCI protected. However, the outlet to push the trip button is located in the garage. We have since switched this outlet to one of the bathrooms to make it more obvious for when the breaker gets tripped. Wonderful property, clean and the amenities were great! From the comfort of the beds to the thoughtfulness of the charging station! We loved it! Highly recommended for anyone traveling to the Oklahoma City area! We were there for a wedding and we loved it! Thank you Jackie for this offer, and for being easy to contact! If we need to travel there again we will definitely book with you! The home is centrally located in Edmond so you are just minutes away from shopping, restaurants, Mitch Park and the YMCA, Barnett Field Splash Pad, UCO campus, Downtown Edmond and still an easy 25 minute drive to Downtown OKC.